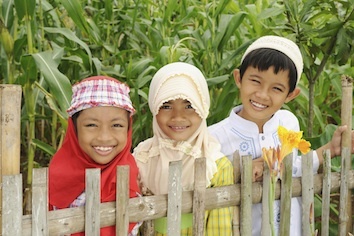 Information for students K-6 about the Muslim religion Islam. People who follow it are Muslims. Their holy book is the Koran. Islam has one god. The Arabic word for god is Allah. Muslims follow the teachings of the prophet Mohammed, who founded the religion in Mecca, Arabia. The Muslim place of prayer is called a mosque. The person who leads the prayers and who gives support and advice is an imam. The holy book of Islam is called the Koran. It tells Muslims how to live according to the five Pillars of Islam. making a trip to Mecca at least once. Muslims are expected to pray five times a day at set times, as they believe Allah taught Mohammed. These times are determined by the position of the sun in the sky, so they vary daily and in different places in the world. Muslims may pray at the mosque, at home, or in rooms especially set aside for prayer in public buildings. Muslims must wash before they pray, and leave their shoes outside the mosque or prayer room. Prayer lasts about 10 minutes, and is done in a precise way, in a series of movements, saying precise words. The place of prayer must be clean, and the person praying must be clean and modestly clothed. A prayer mat is placed on the floor. When they pray, Muslims must face the direction of the holy city of Mecca, the holiest place in Islam. The time of praying must be absolutely accurate. Before beginning to pray, the person must stand and think about the purpose for this prayer before raising their hands and saying, 'Allah-Akbar' and saying the first prayer. Then bowing deeply, Allah is praised. The next part of the prayer is said while kneeling, with hands and head placed on the floor. The final section of prayer is kneeling, sitting back on one's heels. Many people carry misbaha (which means 'praise to God') or subha beads when they pray. A string of 99 beads represents each name of Allah and a subha of 33 beads helps people count things they must repeat a number of times in their prayers. The clicking noise or feel of the beads help concentration while praying, and help one put aside worries or concerns. The dates of Muslim festivals and holy days are worked out by the phases of the moon. The most holy Islamic festival is Ramadan. It takes place in the 9th month of the Islamic lunar calendar. For each day during the month of Ramadan, Muslims must not eat or drink between sunrise and sunset. It is a time to visit family graves and to say extra prayers and to think about living a good life. At the end of Ramadan, there is a big festival called Eid-ul-Fitr (say eed-ool-fit-r), which means 'Feast of Fast-breaking', when people celebrate and exchange gifts. Because the month of Ramadan is all about fasting, Eid-Al-Fitr is all about NOT fasting! It is often celebrated over three days. Muslims are encouraged to dress in their best clothes to attend a special Eid prayer at their mosque. Before the prayer begins, Muslims make a food or cash donation (called the Zakat al Fitr), which is then distributed to the poor. Also on this day people are encouraged to settle feuds or disputes, especially those between family members. The Koran tells both men and women they must cover themselves and wear modest clothing. It does not tell them how to do this or what to wear, so there are a number of different ways in which Muslims dress, which is often different in different countries. A hijab is a scarf worn by some Muslim women covering the head and neck. It is worn for modesty outside the home. A woman chooses to wear or not wear the hijab. In Australia Muslim women mostly wear a hijab in a variety of ways. Many women and girls wear modern western style clothing but with a coloured headscarf. 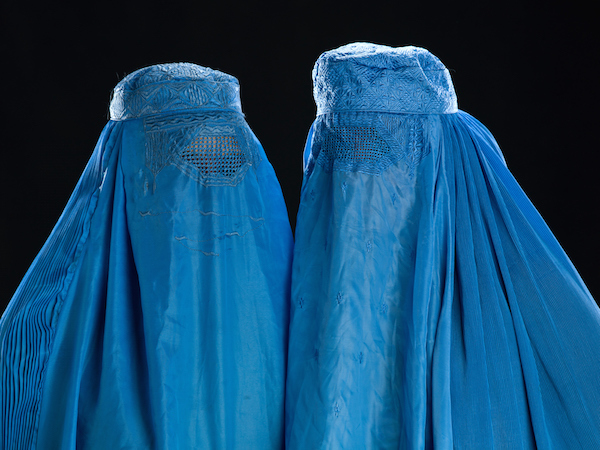 Worn outside the home, a burqa or burka is a garment that covers a woman's entire body, including the head and face, with a mesh window over her eyes. A niqab is an addition that covers a woman's face except for the eyes. Both the niqab and the burka are worn by some Muslim women in Australia but are more common in other countries. Many women in Iran wear a long cloak called a chador, that they hold closed at the front. Common in some Asian countries is a dupatta, a long scarf draped across the head and shoulders. For men, there is also traditional clothing but these tend to vary according to different countries. In some countries there is a long loose garment called a thobe (say thawb), often white, worn with a rectangular headscarf held in place with a rope band. There is also long shirt-like tunic worn over loose matching trousers. In some countries men wear a turban or a skull cap.